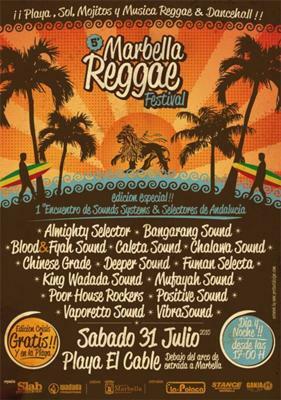 Don´t miss the fifth Marbella Reggae Festival on Saturday July 31 at 5:00pm at El Cable Beach under the east Marbella arch. The Marbella Reggae festival is an opportunity for everyone young and old to enjoy sounds from international artists which include Max Romeo, Sizzla, Michael Rose, Buju Banton, Caleta Sound, Chalawah Sound, Bangarang Sound, Blood & Fyah Sound, Alborosie and more! The bands will play for 13 hours starting at 5:00pm and lasting till the wee hours of the night. There will also be the First Edition of selectors and sound systems from Andalucia that represents the finest from Cádiz, Seville, Granada, Cordoba, Almeria and Málaga.